The 300 block of North Church Street is home to a couple of institutions, the Spartanburg Memorial Auditorium and Krispy Kreme Doughnuts. Now, another institution has a permanent presence on the block. Friday, the city unveiled a plaque honoring John Bryan, the founder of the annual Assault on Mount Mitchell. In a salute to Bryan, the auditorium also placed a red bicycle sculpture that will also serve as a bike rack above the plaque. 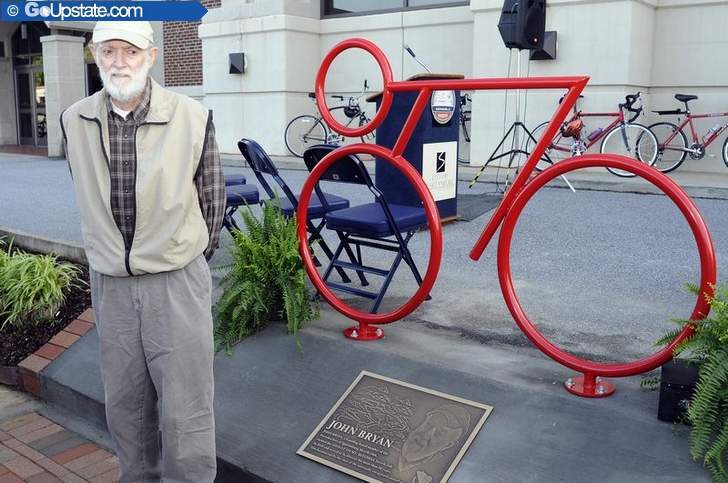 Both were installed in front of the auditorium and are a tribute to Bryan, whom many consider the patriarch of Spartanburg’s cycling community. Next month will be the 33rd annual Assault on Mount Mitchell, which will have 1,000 participants, including riders from abroad. Six weeks ago, the 102-mile ride’s online registration was filled within seven minutes. Another 500 to 700 people will begin their ride to Marion, N.C., in the 72-mile Assault on Marion. Cyclists in both events will begin their treks from 385 N. Church St., which has been the starting spot for the rides for a number of years. “It’s moved away from here but always came back,” said Bryan, 73, who plans to step down from organizing the ride after this year. He said the auditorium has been a good spot because it’s centrally located and easy for out-of-town people to find. Bryan’s first bicycle trip to Mount Mitchell was in 1974 from his west-side home. He rode with a few friends the next year and began organizing rides for the Freewheelers of Spartanburg Cycling Club from the former Sky City retail store on Highway 221. The event has earned recognition as one of the 10 toughest rides in the country. Bryan’s focus over the past few years has been the overwhelming task of organizing the ride, which has 500 volunteers. Keith and Patsy Shealy of Newberry were among those attending Friday’s ceremony. Keith Shealy met Bryan after completing the third Assault on Mount Mitchell. Shealy and Bryan became friends and participated in an Ohio ride together. Shealy said he’s excited about all of the interest in cycling across the state and he knows Bryan has played an integral role. Bryan is known for sharing cycling advice, and he once helped cyclists train for the 750-mile Paris-Brest-Paris ride, an event which he was the first South Carolinian to complete in 1983. He was in the hospital during the 2005 Mitchell/Marion ride, and many longtime participants sent cards and letters after not seeing him. He has battled lymphoma, and continues to fight it today. “I’ve met a lot of rock stars and people in show business, but people don’t know that John is a rock star in the cycling community,” said Steve Jones, the auditorium’s general manager, who has helped Bryan prepare for the assault for more than 20 years. Jones visited Salt Lake City last year and saw red bicycle sculptures all around the city. The sculptures served as racks and were installed when the city hosted the 2002 Winter Olympics. He bought one and had it in storage. The city approached him about installing a plaque to honor Bryan, and Jones realized it was a good time to pull it out. The plaque was designed by Ralph Paquin, a local artist and cyclist. Local elected officials attended the ceremony after participating in a 1.3-mile ride on National Bike to Work Day. Many expressed their commitment to making Spartanburg a safe place to cycle, and they celebrated the city being designated bicycle-friendly last year by the League of American Bicyclists. They also expressed appreciation to Bryan and posed for pictures with him.